Sisters Lisa Daly and Marsha Fields buried their mother Patricia Brody on Jan. 29 at Ohev Shalom Cemetery in Brookhaven, but concerns over a cemetery error distracted them at the funeral. Ohev Shalom Rabbi Jeremy Gerber told the Jewish Exponent that Daly’s mother and father are buried next to each other, as stipulated in a receipt for the grave. But during the funeral, the sisters saw their father Bernard Brody’s headstone — he had died decades before — at the head of her mother’s grave. Their upset was only compounded by a conversation Daly had with synagogue staff days before, when she was told there wouldn’t be room for her mother to be buried next to her father. Gerber said at first it appeared there wasn’t room because Bernard Brody’s headstone was placed too far over to the side. That probably happened, Gerber said, when the father was buried in 1972. 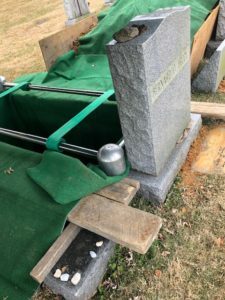 When the synagogue’s grave-digging service came to the cemetery, they found that the headstone was not in the correct spot and that there was actually room for the two to be buried next to each other, Gerber said. He said the headstone will be moved to the correct location. Carl Goldstein, supervisor director at Jewish funeral home Goldsteins’ Rosenberg’s Raphael-Sacks, saw the grave and said it appeared that Bernard Brody’s monument was in the wrong place, but he couldn’t say for sure. Patricia Brody’s grave, he said, looked normal other than that. “The grave looked as clean as any other grave I’ve been to,” Goldstein said. But the explanation has not provided comfort to the sisters. The timing was also problematic. Daly said the synagogue informed her that her parents couldn’t be buried next to each other as the sisters were sitting by Patricia Brody’s bedside, already aware their mother didn’t have much time left. At the time, Daly said, the synagogue gave her several options that she said were not acceptable. The synagogue told her that her mother could be buried on top of her father, her mother could be buried next to Daly’s plot in the cemetery or that her father could be exhumed and the two could be buried somewhere else. Daly said she wants this story out there to prevent this from happening to others. She suggests that others check on graves they have purchased, which she intends to do. The cemetery is 110 years old — older than the synagogue itself — and many of the records are handwritten, Gerber noted. He said the synagogue is examining the cemetery records to ensure all the information is correct, including making sure the handwritten and digitized records are identical and continually updated. “Everyone at Ohev Shalom is very well-aware of how emotional a death can be, and how crucial it is to have certainty and confidence in how these matters are handled,” Gerber said. The synagogue has been in touch with Daly since the funeral, she said, to set up a time to show the sisters where their parents are buried. Fields said she is skeptical that there’s anything the synagogue can do to make the situation right. i sympathize with their gravesite problem. My father Dave Lipner, a WWI and WWII veteran yet a peace activist in Philadelphia and then Miami wanted nothing more than a peace symbol on his marker at Mt. Nebo in Miami. When the time came, they were disrespectful and refused his wishes, however, through the help of a friend, Lakeside in Miami graciously provided for his request. As mapper and archivist for a synagogue-owned cemetery in New Jersey, I read this story with much sympathy. Although the error happened many years ago, those years could not mitigate the grief experienced by a bereaved family. What we should learn from this is that, before allowing installation of a new monument, the cemetery committee or equivalent must always mark the grave themselves and then supervise the installation. As for the last question, “How do you prove that my mother is actually next to my father?” there are two kinds of technology which can be helpful: (1) ground-penetrating radar, which can locate buried wood such as a casket, and (2) an earth-conductivity meter, which can differentiate between compacted soil and undisturbed soil.